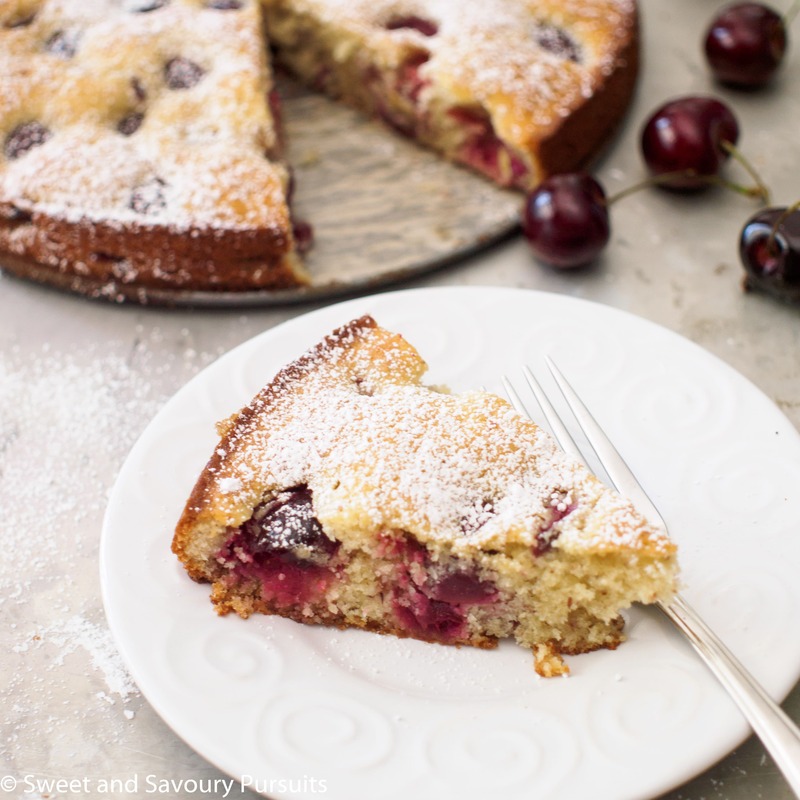 This beautiful, simple and delicious Cherry Almond Cake is studded with juicy fresh cherries and has a delicate almond flavour. My favourite fruit is the cherry. I just can’t resist sweet fresh cherries and when I’m at the market I always end up buying way too much. After enjoying many au naturel, I thought it would be nice to bake something with the remaining cherries. I knew that I wanted something almond flavoured since almonds and cherries complement each other so well. After a bit of research online, I came across a recipe from Joy of Baking for a Cherry Cake. I made a couple of changes to the ingredients and simplified the preparation method. 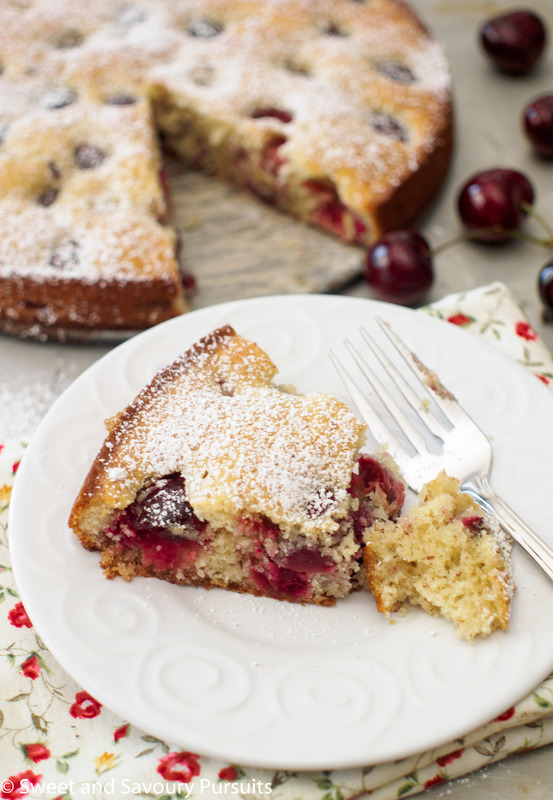 This cake has cherries mixed in the batter but is also studded with additional halved cherries. Adding some halved cherries to the top of the cake before baking ensures that you have cherries throughout the cake and that they don’t all sink to the bottom. The cake has a delicate almond flavour coming from the ground almonds as well as from the pure almond extract. If you don’t have any almond extract at home I highly recommend you get some. Pure almond extract imparts a delightful nutty flavour to your bake goods, and a little goes a long way. This Cherry Almond Cake is simple to make and is perfect served at room temperature. I like to serve mine with a light dusting of powdered sugar. Grease the bottom of a 9-inch springform pan, line it with parchment paper and butter the sides and paper with butter. Rinse the cherries well and set aside 15 cherries for the top of the cake. Pit and quarter the rest of the cherries. If you have a cherry pitter then this will be a much quicker task. If not, you can use a small paring knife to cut around the cherry, split it in half and remove the pit with your fingers. Take the remaining 15 cherries and pit and halve them, set them apart from the quartered cherries. 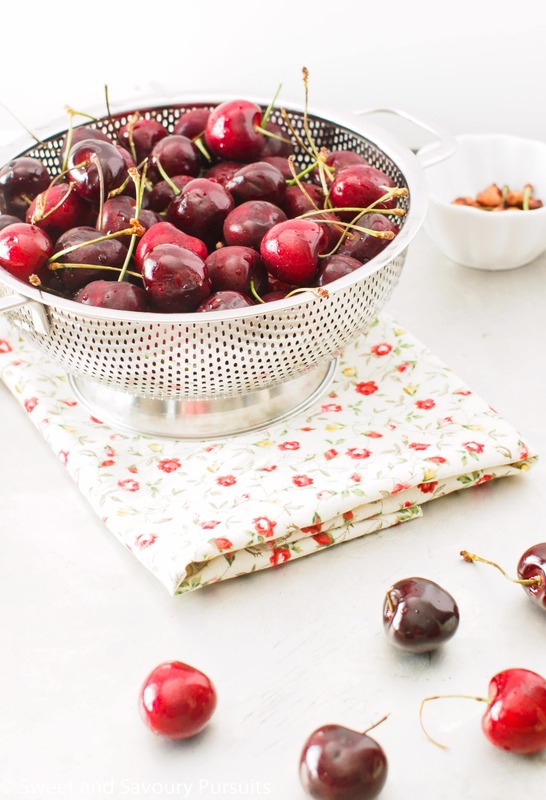 Place the halved and quartered cherries on separate sheets of paper towel, cut side down. In a small bowl, whisk together flour, almond meal, baking powder and salt. Set aside. In the bowl of your mixer, combine butter and sugar and beat on medium speed until pale and fluffy, about 3 to 5 minutes. Add eggs, one at a time beating just until combined. Add the sour cream and almond extract and beat until mixed. The batter will look slightly curdled at this point but that’s ok.
With the mixer on low speed, gradually add in the flour mixture and beat just until the flour is mixed in. Add the quartered cherries to the batter and fold in with rubber spatula. Evenly spread the batter into the pan and then arrange the halved cherries (cut side down) on top of the cake. Bake for approximately 25 minutes, until the top is golden brown and a toothpick inserted in the cake comes out clean. Remove the cake from the oven and let it cool to room temperature. If desired, once the cake has cooled you can dust the cake with a bit of powdered sugar. Yum! I love fresh cherries! This looks so delicious! what a yummy tea cake! Yes, I’m making sure that I take advantage of the season. You’re welcome! I love cherry cake! Right now is a perfect time to make it! What a perfect cake for summertime cherry season! Yum! I’m in complete agreement with you 🙂 Thanks Amanda!